REV. J. HILTON JEPHSON M.A. Emma is buried on her own at the right-hand side of the triple plot reserved for the Jephson family. 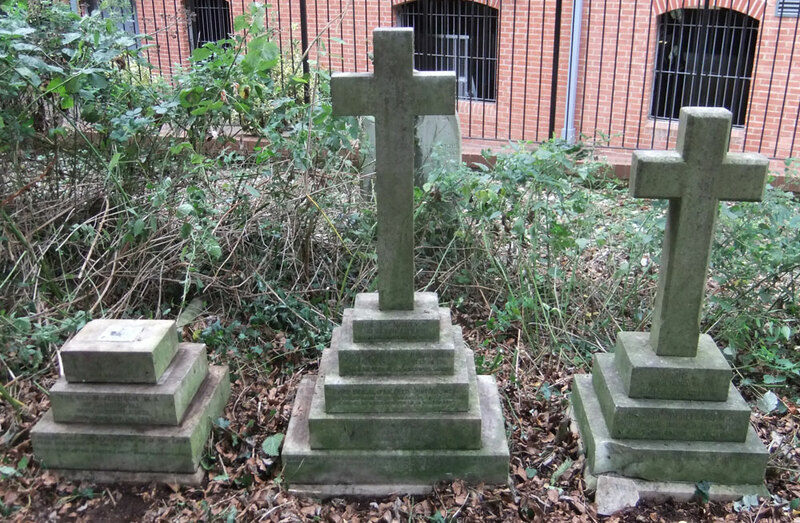 For more about the background of Emma’s husband, the Revd James Hilton Jephson, see the separate page about the adjoining graves of his mother and sisters. Emma’s father was in the army, and eventually became a General of the 4th Dragoon Guards. In March 1820, when Emma was ten, her father Richard took with him to South Africa a group of twenty servants drawn from Chieveley in Berkshire: they became known as the Pigot Party, and the town of Chieveley in South Africa is thought to have evolved from their settlement. Emma had at least two siblings: Clara Pigot (born in Marylebone in 1828/9) and Albert Hance (born in Pimlico in 1843, reg. second quarter); the latter changed his name to Albert Hance Pigot in the 1870s, and it seems likely that he was her illegitimate half-brother. At the time of the 1841 census Emma (31) was living in West Berkshire at Roseland’s Cottage, Bucklebury, Berkshire with her father Richard Pigot (now a widower aged about 67), and was probably keeping house for him with the help of three servants. They were still living at Bucklebury in 1851, and Emma’s unmarried sister Clara (22) was now staying with them. They still had three servants: a cook, groom, and housemaid. By 1861 Emma (51) and her sister Clara (29) were living with their father, who was now 87, in Chieveley village, and they had three servants as before. Two young people were staying with them: Charlotte Newton (25) and Albert Hance (17): both were described as visitors, but Albert appears to have been Richard Pigot’s illegitimate son, and it is possible that Charlotte Newton was his illegitimate daughter. John Hilton Jephson, Emma’s future husband, was born in Camberwell, Surrey in 1828, the son of William Jephson, the Headmaster of Camberwell School, and his wife Prudence Armroid (see his mother’s and sisters’ graves for more information about his parents and eleven siblings). He was matriculated at the University of Oxford from Magdalen Hall on 11 March 1847, aged 18. His father died in 1848, and his mother and some of his sisters went to live with his uncle in Hanworth. John (22) was a student of Magdalen Hall boarding at 80 Holywell Street in 1851, and was awarded his B.A. on 22 May that year (but did not take his M.A. until 1876, by which time Magdalen Hall had become Hertford College). He was ordained Deacon at Ripon Cathedral in March 1852, and Priest at Worcester Cathedral on Sunday 20 February 1853. At the time of the 1861 census John was a clergyman without cure of souls, living with his brother William Jephson and his family at Hinton Waldrist, which was then in Berkshire. in the second quarter of 1862 in the Aylesbury district (probably at Chieveley), Emma Pigot (52) married John Hilton Jephson (34). On 21 November 1868 Emma’s father Richard Pigot died at Chieveley at the age of 94, and his effects came to nearly £9,000. † Mrs Emma Jephson, née Pigot died at 19 Norham Gardens at the age of 69 in January 1879 and was buried at St Sepulchre’s Cemetery on 9 January (burial recorded in parish register of St Giles’s Church). At the time of the 1881 census John Hilton Jephson was still living at Gunfield, 19 Norham Gardens with his unmarried sisters Mary (58), Sarah (48), and Prudence (42) and their six servants. 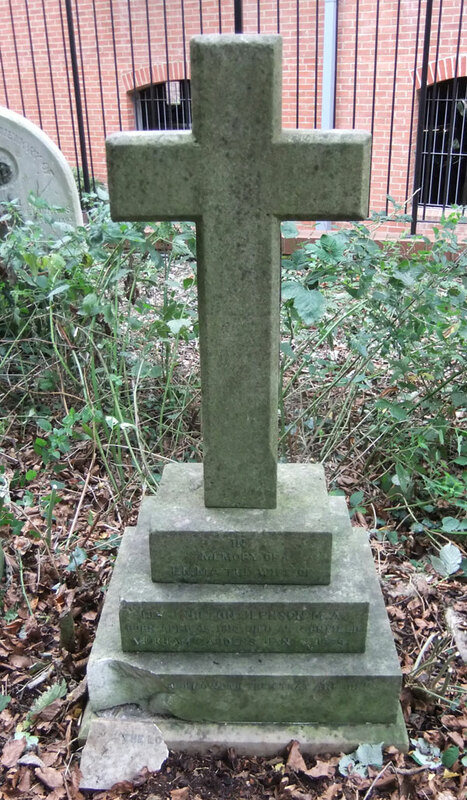 † John Hilton Jephson died in the Greenwich district in the third quarter of 1901, and was presumably buried there. Clara Pigot (born 1828/9), Emma’s full sister, never married. At the time of the 1871 census, when she was 44, she was living in Berkshire at Oxford Road, Chieveley with her half-brother Albert Hance (27), who was described as her brother, and four servants; the situation was the same in 1881, except that her half-brother now gave his name as Albert Hance Pigot, and their address was more precisely named as The Cottage, Chieveley. The cottage must have been large, as they still had four servants: a cook, housemaid, coachman, and stable boy. They were still at Chieveley Cottage in North Heath Road in 1891 and 1901. She died in Chieveley at the age of 75 in 1903 and is buried at the churchyard there. Albert Hance (born 1843) changed his name to Albert Hance Pigot in the 1870s, when he was living with his half-sister Clara. He remained at Chieveley after Clara’s death, and at the time of the 1911 census, when he was 67, he was living there with two servants, and described himself as a retired civil servant of private means. He died in the Reading district at the age of 84 near the beginning of 1928. Charlotte Newton (born in London in 1836/7) was possibly Emma’s half-sister. She is hard to find in the censuses after 1861, but may be listed under a married name.